EXCERPT FROMMarine Survey Report "Blue Pearl", Frers 47 2012, Date: June 26th 2012. Michel SavageAccredited Marine Surveyor, SAMSSummary of VesselBlue Pearl, in a new vessel, lavishly laid out and equipped with the latest and most sophisticated instruments and systems. The owner bought a 1983 Beneteau 456, a German Frers design, and stripped everything off except the deck. He repaired the latter as needed, modified the keel, completely gutted the interior and started from scratch.Absolutely everything in the vessel is top notch, certainly far better than most production boats of the same size. 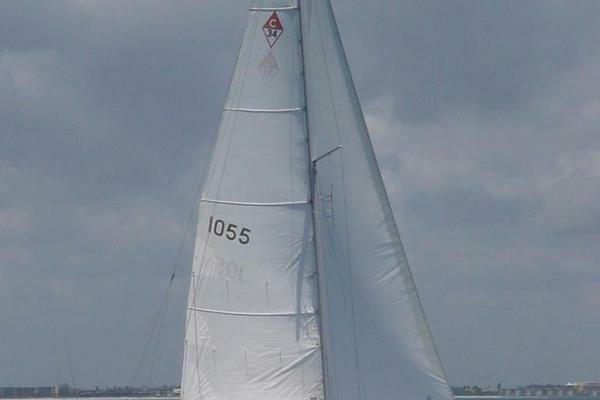 United Yacht Sales New Jersey would love to guide you through a personal showing of this 47' Frers 47 1983. This yacht for sale is located in Warwick, Rhode Island and priced at $395,000. For a showing please contact us by filling out the form on this page and we will get back to you shortly! 1) Bed is fitted with hydraulic lifts with huge storage for charts and large items underneath. 2) Under mattress: - Lee cloths (brand new) 3) Port closet: - Master bed sheets and extra set. All bed sheets are of 1st quality Egyptian cotton. Neutral color. 4) On starboard shelf: - Extra wood pieces from the boat (they can be stored under the hydraulic lifting master bed if you prefer). 1) Top shelf: - Remote control for Simpson davits - Remote control for TV - Key for filling inlets to tanks: water, diesel and holding tank - Touch up paint for hull - Cleaning product for Sunbrella (cockpit cushions) 2) Side drawers: - Note: Top drawer is made to store a laptop - All the files on the equipment installed on Blue Pearl (I did not have time to go through the files this time. I will need to do so before the boat is sold and retrieve some info for tax purposes). - CDs for various applications for equipment on the boat - Spare black plastic propeller (could be for the bow thruster) - Spare parts for Lewmar - Set of 2 straps for additional securing of the dinghy when it is raised on the davits 3) Behind captain’s chair: - Remote control for Furuno Autopilot in small cloth bag. (The plug for the remote is located on the top starboard side of the companionway) - Printer (perfect fit in that slot). On top of the wavy cabinets: - Extra leatherette cover (folded) – brand new - TV related player Note: Inside one or two of the wavy cabinets are removable bottom sections for hiding important documents or valuables. They can be accessed from behind the back pillows of the salon settee. PLENTY of storage underneath the seats and behind the back pillows of the salon settee. The 2 bucket seats are made to swivel. They have adjustable lumbar support. - Folding anchor in a red cloth bag (to be sold separately as an extra), - Retainer for the boom, - Folded genoa pattern and other items. Dodger & Bimini – I did not have time to install them. They are folded & stored in the port starboard cabin. Note: the removable flexible solar panels are folded into the bimini, which makes the outside of the boat aerodynamic and uncluttered. Individually labeled beige bags for sun, privacy & bug-screen canvas (look like long tubes stored in aft starboard cabin). Batteries are under the salon settee adjacent to the little bar, next to the navigation table. There are 6 more batteries for Blue Pearl, which were ‘removed till needed’ for ocean crossing.